There are several places a child can send a letter to Santa where he will receive it and send a letter back. Millions of letters to Santa are received by the US post office each year addressed to: Santa, North Pole. Many are just tossed or lost in the shuffle, but the Post office has developed a volunteer program in recent years and some Santa Letters are answered. 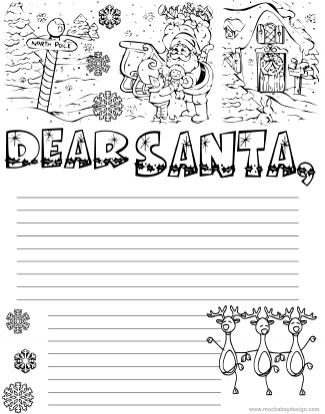 More information on this Santa Letter program can be read here. 1) Have your child write their letter to Santa. 2) You compose a Letter From Santa to your child. If you think your child may recognize your handwriting - ask a friend or relative to write it for you. You can also compose the Santa From letter on your computer, print it out and just sign it with a flourished Love, Santa signature. Enter Your Child's address in the Addressed To section of the envelope. When the post office gets this letter, when they open it up - your letter will be inside - already stamped and addressed, and they'll send it off back in the mail. It will be postmarked from the North Pole. It's best to do this early as they receive many, many letters each year. Try and send off your Santa Letters in the mail by December 15th. Santa is a real trickster ... he has his mail forwarded from a town called North Pole (which is a real town in Alaska) to his real address in the Arctic where the North Pole actually is. Santa comes down once in a while or sends his elves to get all his mail for him. Santa has to keep his real home at the North Pole as a secret place just for him and the elves.